I think I've mentioned before, that I like to invite visiting family, and friends to jump in, and act as adjunct professors, whenever they happen to be passing through. ...I was happy to set up an ambush...er...art lesson for them to do along with my mother, who happened to be visiting this week, and who also happened to have brought along a lovely set of acrylic paints, and brushes, as well as an extra set of 9x11 inch canvas boards. I think she had been hoping to spend some time painting our lovely mountain views, but since they are currently clouded in with a heavy cover of forest fire smoke, she was willing to give up, and settle for painting with the children. If you don't have a visiting artist in the house, you can pick up a small set of acrylic paints, brushes, and canvas boards at an art or craft supply store, or even Walmart. A little paint goes a long way. It dries fast, so you don't want to put too much out at once. Oh, and it's good for younger children, because it washes off (most of the time) from clothing, and tables. Just to be on the safe side, I covered our table in butchers paper, before we started. I also made things easier for the visiting professor, by having everything ready - canvas boards, box of paints, several sizes of brushes, jars of water, paper towels, and our story book, to use as a guide. Then, I got the girls started, by having them paint their boards with a blue background, so they'd be dry, before Grandma stepped in to work with them. Using a page from the book, she showed the younger girls (while the older girls worked on their own) how to sketch leaves with a pencil, and them fill them in with paint. ...and how to dab clouds into the sky, and add short flowing brush strokes, to suggest the wind. ...while E (age 6) stayed closer to the style of Erdogan's illustrations. 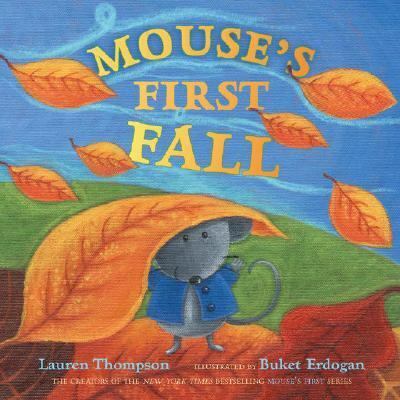 I helped with the mouse, learning in the process that orange+blue+white makes gray (I would have have guessed, light brown). And, of course, I took care of the clean-up...sigh. It was a looong day of painting, that pushed the limits of my five and six year olds' attention spans, and the endurance of a certain 80 year old, but it was very rewarding to be able to place the girls' paintings beside the illustrations in the book, and be able to see the texture in the one, and touch it on the others. Not to mention the fact, that the girls had a great day of memory making with their grandmother. For more story themed arts and crafts for children, check out this week's stART (story + ART) link-up, at A Mommy's Adventures. How special that they got to do this with their grandma. These memories will last a lifetime. Their artwork is very pretty. What beautiful artwork and an even more beautiful memory of a special time with their Grandmother that they can treasure as they grow. Beautiful artwork and I agree -- "It's great to be a homeschooler!" What a special day with grandma. I seem to be having one of those not finishing thoughts day. That is a cool project. They turned out so close to what hte book looks like. These paintings look wonderful! How nice that grandma is such a good artist! This is so special! Their paintings are wonderful! Beautiful pictures!! I love the connection to the book too. 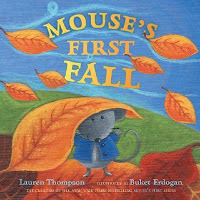 We just read our first mouse book this week and I am crossing my fingers the library will have this one! Thank you for sharing!